We are off in a couple of days so this will be the last post for a week or so. Mum says it is very warm there (hurrah!!) so we will hopefully be having our now traditional picnic on the beach on Xmas Day and barbecue. We are also having a big family meal on Christmas Eve at the local Chinese buffet which the children love. You chose your uncooked food and the chef cooks it for you and you can watch. The children are always most impressed at how he remembers which order belongs to them. They have been doing quite a bit of cooking this week using the new raclette and the fajita grill. It is excellent for me as saves loads of time. I just prepare the meat and veg and we cook it at the table. Below is a pic of the raclette so that you can see it in action. The small pan handles can be seen sticking out from under the grill and there is one on top warming oil ready to be filled with meat and veg. Jake is now very happy and plans to have raclette and fajitas once a week each at least! Note that is my plate there – healthy salad (the kids don’t do that sort of stuff!). Have also been busy finishing off Xmas stitching – up till 1 am this morning but cannot post pics till have given the gift. This project was a bit of an experiment but I am very pleased with the result and will post pics when I return. Will leave you with another pic of glamorous daughter – this was taken on a night out recently for a friend’s 18th birthday. Poor Ellen is not 18 till March and can’t wait. Neither can we – she is taking me and Uncle Ben for a drink! Ellen, Maxine and Charlotte - Happy 18th Charlotte! And of course the song goes – ‘so what have you done , another year over and a new one just begun’. I know it is not Christmas yet but here we have been celebrating early as we are off to Spain next weekend (hurrah) for some r and r in the warm. So this weekend we had our now traditional pre Xmas party and celebrated early with Xmas dinner and some of the pressies. My brother Ben came to us today for pressies and dinner – sadly his partner Amanda had to work. They got the kids some fab Xmas pressies from them so big thanks. The first was a fajita cooker that you use on the table top – it’s a small griddle with pan included. Jake’s favourite food in the whole world is fajitas so he was thrilled. They also bought them a raclette which is another table top grill which comes with little pans – you cut up meat, fish and veg, top with cheeses and grill your own food at the table – a very sociable way of eating. They have had one for years and the kids love it so so they are very pleased to have their own. We are going to try it out tomorrow then use it for New Year when my sister and her kids are here. Below are some pics from the party and our xmas dinner. Jake wearing all the cracker hats!! So another year over and what have we done – well loads and loads as usual, holidays, work, the build, Nepal the new life stuff – been a very, very busy year. I have also had this blog for just over a year – forgot to check when the date was but sometime last Nov I think. Am really looking forward to next year which is nice to be able to say as there have been some bits of this year that have been very stressful!! But that is all over now – still got a bit of decorating to finish but that will get done. Have been having such a good time just recently and am looking forward to lots more of the same wonderful stuff. So I hope that you all have a lovely festive season wherever you are! My best wishes to you and yours. A couple of weeks ago I had a reunion in Yorkshire with some old friends – we all were at college here (we met 25 years ago) and have met up at intervals ever since but the last time was about 6 years ago so it was wonderful to see them all. We had a great time revisiting old haunts on the University campus, doing a tour of the new pubs in town and having a curry and were very pleased to see that we can still hack it – we started at 2pm and were still going at 1am which is not bad for a group of forty somethings! Here is a pic of the guys – most of whom are called Dave bizzarely enough – and girls in one of the local hostelries. 25 years on the Class of 83 - not looking bad! So a lovely few weekends – we are having a party here next week – my usual pre – Xmas event – an excellent time is being had!! Apologies for the lack of posts recently. Have been back from Nepal for a while but returned to various technical issues including lack of PC and Internet and since those have been fixed have been trying to find time to put together a summary of my trip including whittling down the 800 odd pics I took to a selection for this blog. I have finally done it so please visit the page – it will take a couple of minutes to load as there are about 50 pics on it. Unfortunately I have had to change my site theme so that you can see the link to the new page – don’t like this one as much but will work on it. What was it like? Very much as I imagined it to be – I have read so much about the country and seen so many pics that much was as I expected. Was not expecting such lovely hotels and restaurants – a lot of it was much more sophisticated and we had swimming pools and lovely food when we were in Kathmandu and Pokhara as well as the roughing it in the village. The work was as hard as I had expected and it was very, very hot but we coped and I am very proud of myself for being able to do this project. Two years ago I had major health problems that meant I was walking with a stick and in considerable pain so the fact that I went at all makes me very pleased. 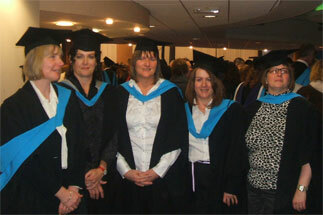 I would also like to thank my Mum and lovely children who supported me so much in wanting to make the trip. You are all fab and I really, really missed you while I was away. Life changing experience no – don’t want life to change any more have had enough changes for a while! Life affirming yes – very much so, have come back stronger, physically and mentally and knowing that I was able to do something really special. I will leave you with a few recent pics – one from graduation this year with my students – my last as the Foundation Course leader as I have gone part-time for this year. 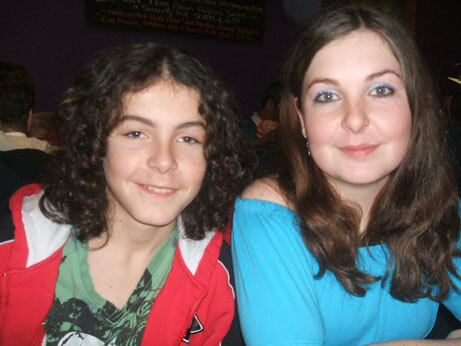 The next is my lovely kids again – this was taken on a recent night out. They are still so supportive and have been so wonderful this year. We went to a friend’s wedding reception on Sunday – congratulations to Nick and Clare from the Team Falchion re-enactment group. 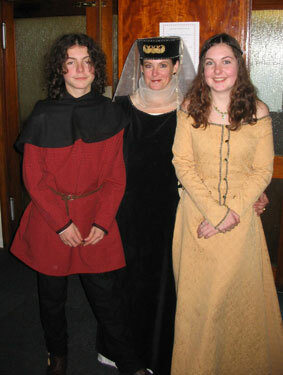 We had a great time and this is me and my lovely kids in our medieval costumes as it was a fancy dress event. Promise that there will be regular updates from now on – as long as my internet does not die again!